Meridian's £100,000 810 Reference Video System | What Hi-Fi? 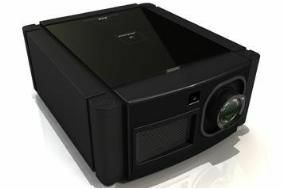 Designed to complement its Meridian Digital Theatre audio system, the new system combines its new 810 Reference Video Projector (illustrated) with the 810 Reference Video Scaler, which is capable of an effective resolution of 4096x2400 pixels. The two units, which will only be available as a package, work together to upscale and project any digital video source, from 480i up to 1080p, in full 10-Megapixel resolution. That's ten times the resolution of standard HD TV, and five times greater than 1080p 'Full HD' images. The projector itself is powered by a PKI Xenon lamp, delivering up to 4000 lumens, and thus able to light even the largest screens to Hollywood reference levels. It also has a native contrast ratio of 10,000:1, and every projector is calibrated individually in a process that takes over four days, the company says. Four different projector/scaler packages will be available, each using a different lens system. The Short, Medium and Long-Throw versions will include a motorised 2.35:1 Cinemascope lens assembly, while there's also a Very Short Throw version designed for back-projection and simulator applications.